While our fresh herbs are taking a season off, Winter Thyme is a chance for Spice Exploration. New dishes featuring seasonings and spices from all over the world. Lemony Thyme was born out of my new found love of cooking (and eating) when I discovered how fresh herbs could bring a dish to life. We bought three whiskey barrels for the back porch and filled them full of young herb plants. Spring Thyme looked something like this when we first began. Today I was given the challenge of coming up with a Shark recipe. Yes I said Shark…as in Jaws (but smaller, teeth removed). What came home from the store was a fresh Shark fillet and a vote of confidence, “I know you’ll come up with something good…and shouldn’t everyone try shark at least once? !” And so the recipe research began. After reading many I began to see a pattern….powerful punchy flavors. Not sure what we’re covering up but I’m all in. 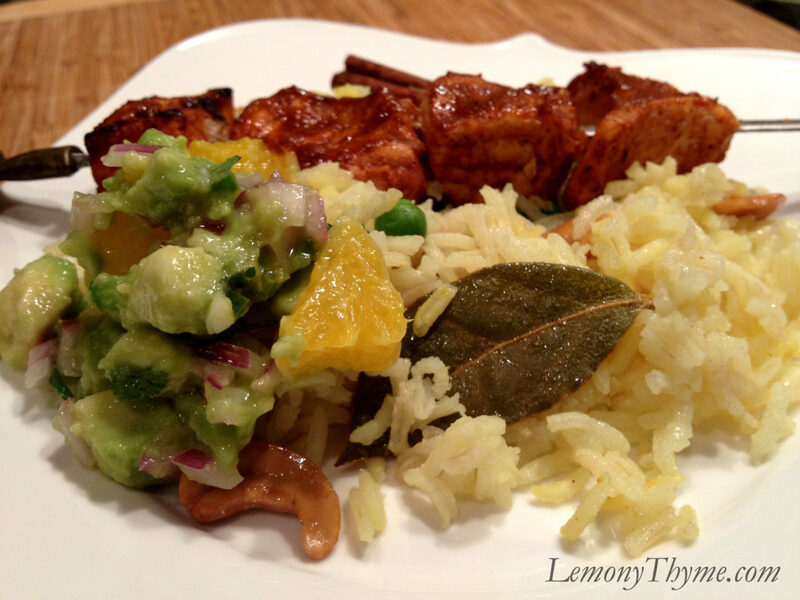 Welcome Shark Kebabs with Orange-Avocado Salsa served over Spiced Cashew Rice. Thank you Epicurious and Food & Wine for these great recipes. The recipe called for a 30-minute swim in a punchy marinade of citrus juices, chili powder, and cayenne pepper. Then it’s on to the grill for you, Mr. What Did Anyone Ever Do To You! 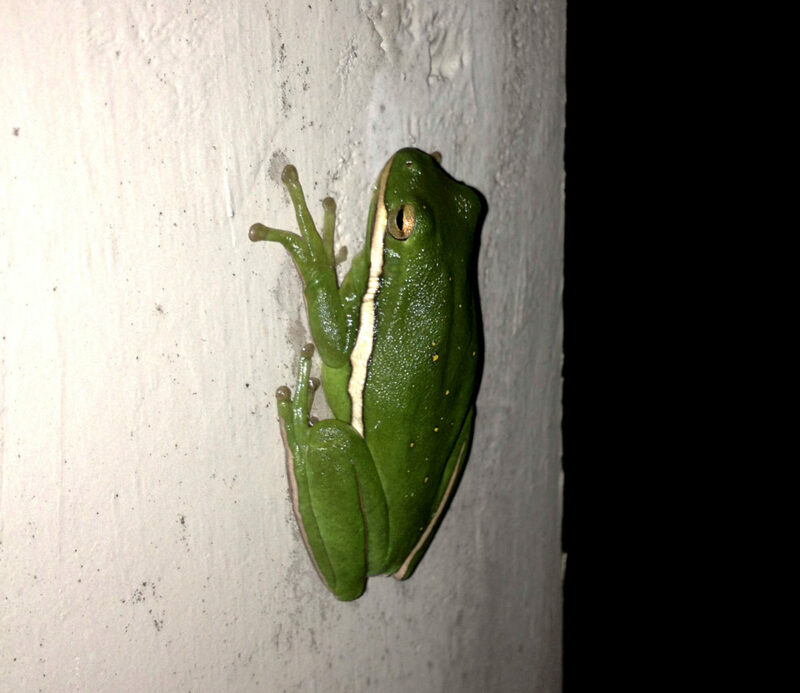 When I went out to check on the kebabs…look who was waiting for me. 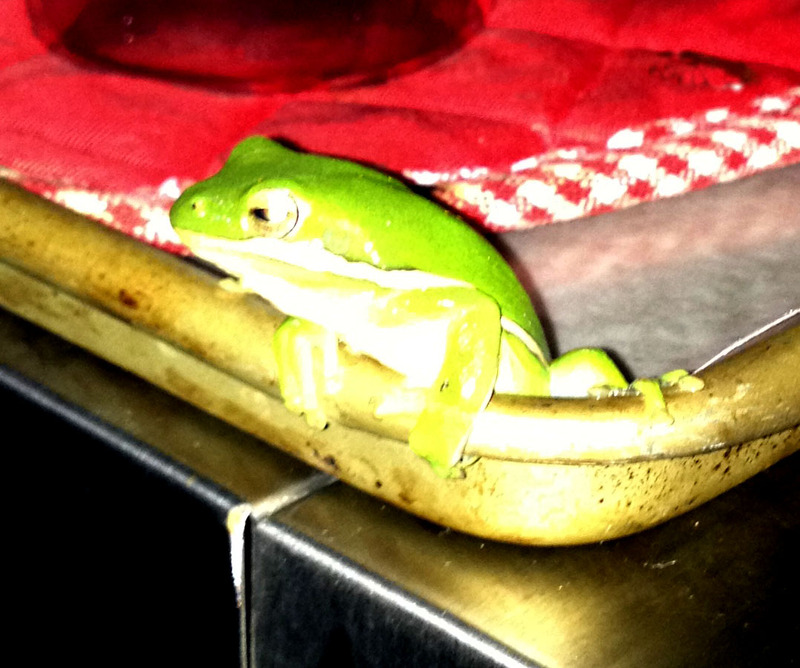 Back away from the grill…no one ordered a frog leg appetizer. Move along little guy. Recipe Note: No frogs were injured in the making of this dinner. Flash forward….dinner is served. Wow! Just Wow!! I wish I could provide more details about the specific kind of shark we enjoyed. This was thick and firm and when cooked it was as mild and moist as could be. While it loved the spicy citrus chili marinade and avocado orange salsa, I’m certain it could be served in a more delicate fashion. Actually, broiled with an herb butter sauce over the Awe-mazing Spiced Cashew Rice would be killer. Nothing at all to fear about this shark. Next time, we’re gonna need a bigger plate! Nothing at all to fear about this shark. Next time, we're gonna need a bigger plate! Mix orange juice, 2 tablespoons lemon juice, 1 tablespoon olive oil, chili powder and cayenne pepper in large bowl. Add shark; toss to coat. Let stand at room temperature 30 minutes. 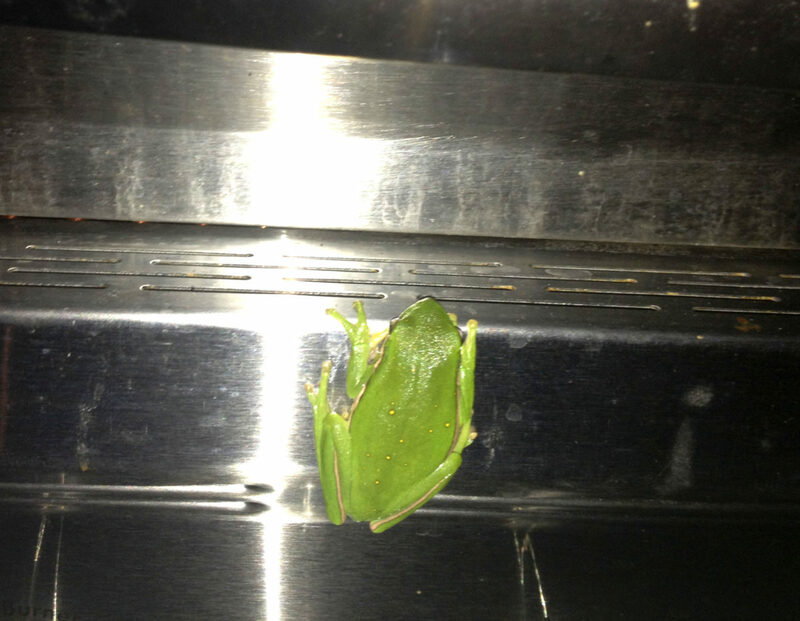 Preheat grill or broiler. Thread shark onto skewers, dividing equally. Grill/Broil until just opaque in center, turning occasionally, about 8 minutes. 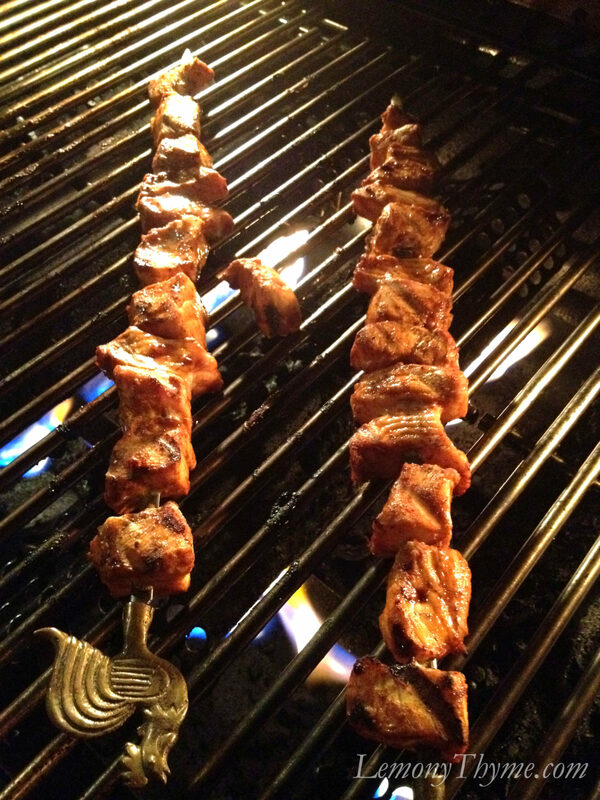 Serve kebabs with salsa. Combine orange cubes, onion, cilantro, garlic, chili, remaining 1 tablespoon lemon juice and 1 tablespoon olive oil in medium bowl. Season to taste with salt and pepper. Gently mix in avocado. Let salsa stand up to 1 hour. 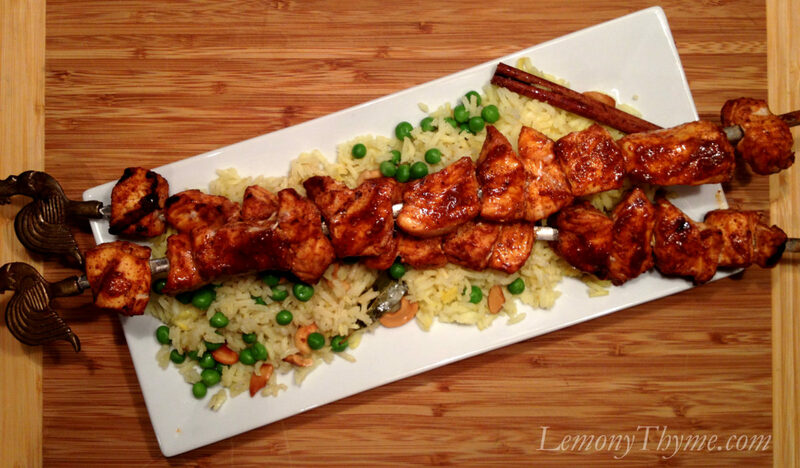 We served the shark kebobs on a bed of Spiced Cashew Rice. Wonderful pairing.